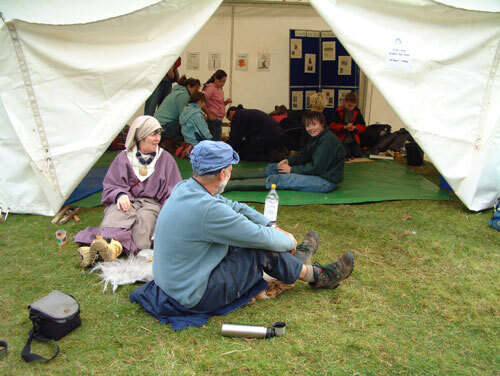 Days of heavy rain and strong winds did not deter people from visiting the High Pasture Cave site during the recent Open Days, which were run in conjunction with the ‘Highland Archaeology Fortnight’. 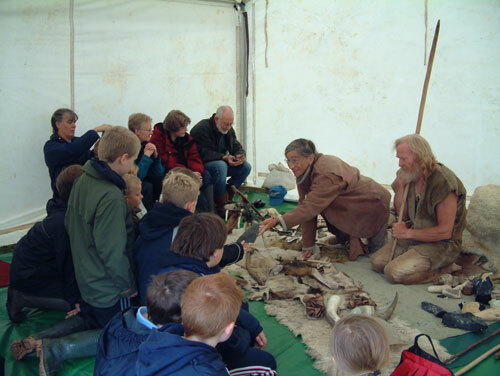 At least 450 people braved the often extreme weather to be guided around the excavation site by the Project Team, after which they were welcomed to the site marquee where John and Val Lord demonstrated prehistoric crafts including flint knapping, bone and antler working and fire-making. During the Open Days two primary schools visited the site through the organisation of Susan Walker, the schools co-ordinator for Skye & Lochalsh District. Struan and Elgol Primary Schools enjoyed the experience, especially during the demonstrations by John and Val. The visits from Struan and Elgol schools to the site are the first of what we hope will be many excursions by all 26 primary schools in the area, most of whom will be coming to site next year during the ‘Highland 2007 Year of Culture’. 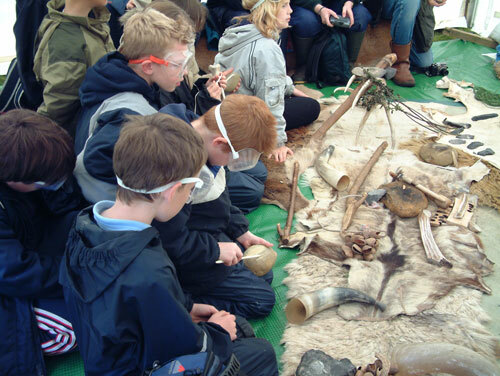 The image below shows pupils and teachers from Elgol Primary enjoying their prehistoric experience, manufacturing prehistoric cordage. 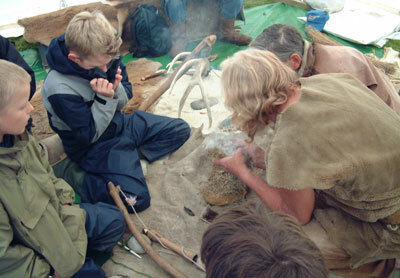 However, one of the most entertaining skills enjoyed by the pupils was fire-making using a bow drill. 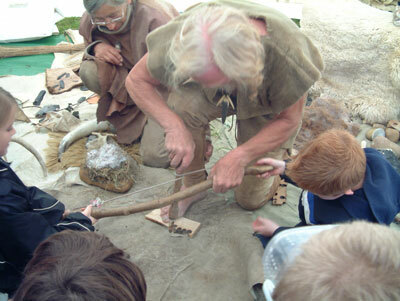 During this demonstration the pupils worked the bow back and forth at some speed to create the smouldering embers of wood that were used to light the fire. The following sequence of three images shows this process in operation, ending with a smoke-filled marquee!! 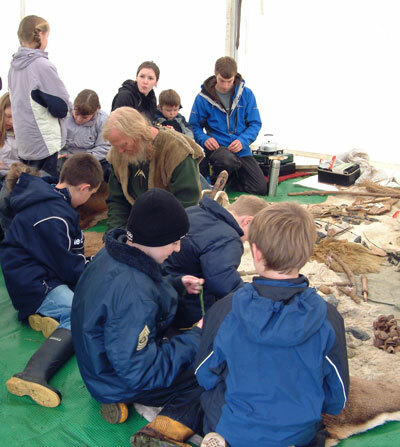 During their visits to the site pupils and the general public were also invited to try their hand at wet-sieving archaeological deposits from the cave. Children and adults alike enjoy this activity, revealing and cleaning a wide range of materials including animal and fish bone, shellfish, charcoal and small finds including pottery sherds and bone items. Other activities also took place in the marquee during the Open Days, many of these organised by the Highland Council Rangers John Phillip’s and Sarah Kay. These included pot-making, the manufacture of copper jewellery and the manufacture of natural cordage using a variety of fibres, while Anne Ross demonstrated the use of the drop-spindle whorl and other processes related to the manufacture of textiles and felt. It was great working with yourselves and also seeing all the school children. They all seemed to be very intrested in what was going on. From what I could see they all like the talk for John and Val. I hope that they all took some great thing back to the rest of the school children. Why is it that the cave is always named “High Pasture Cave” when there was an existing Gaelic name, “Uamh an Ard Achadh”? People don’t translate Portree to King’s Port, or Kyleakin to Haakon’s Narrows, so why is the alien name promoted? I first became aware of the cave from Grampian Speleogical Group’s comprehensive survey of the Caves of Skye, published in 1995. The great majority of the caves mentioned in their book have Gaelic names even if recently discovered by non Gaelic speakers. Their publication did not show any trace of the colonialist mentality displayed in your press releases and website. You do mention “Uamh an Ard Achadh” once in the web-site title and once more in the short description, but once this token gesture has been taken care of, it’s all “High Pasture Cave” (107 mentions). 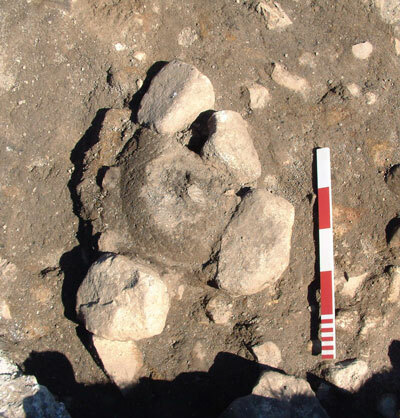 In recent times, the science of archaeology has been trying to clean up its act in terms of imposing an Anglo-centric, colonialist view of the world and to give some credit to local knowledge when it comes to traces of ancient peoples. 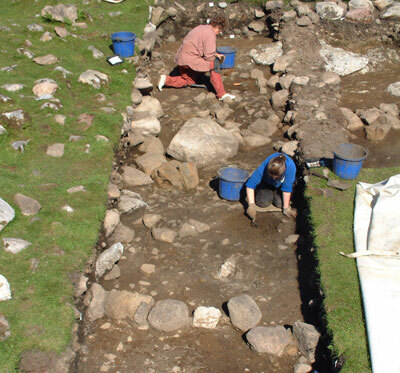 The coverage of the dig at Uamh an Ard Achadh is not following that enlightened path at the moment as it is doing its best to ignore this area’s living indigenous language, a language more ancient than English.